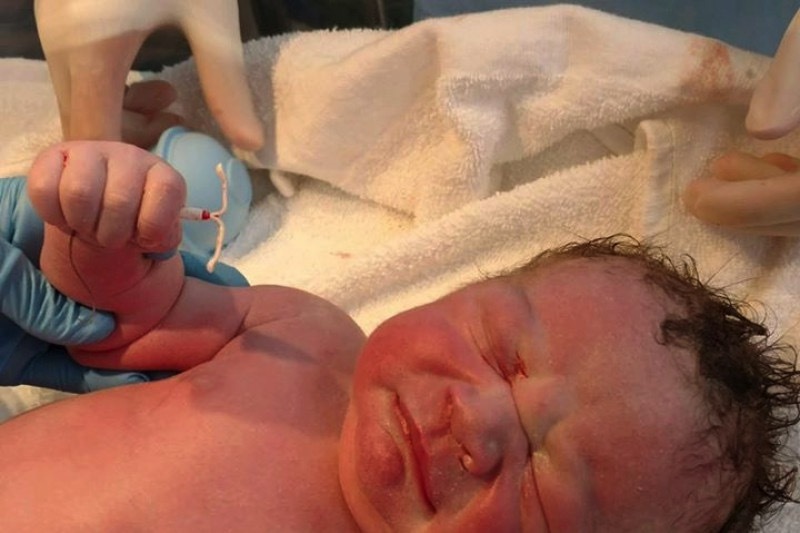 By now you may have seen the photo of a newborn clutching the Mirena IUD shortly after birth. I’m sure we were all thinking the same thing. Was that baby born holding the IUD. Did he rip it out and then hold on to it while in the womb? Could such a thing happen? Well the answers are no, no and possibly. But not it this case. The image has been somewhat sensationalized but the true story is still a bit scary. Mom Lucy Hellein had the IUD ‘installed’ last Summer. “This was actually my third IUD, my first two worked great,” she told Global News. Despite this, she found out she was pregnant in December. During that first ultrasound, doctors revealed she was about 18-weeks pregnant. They also couldn’t locate IUD and assumed it had fallen out. “I was sure it was somewhere inside me still,” she said. Because there is just a small chance(1%) that women using the Mirena IUD can get pregnant, she started adding the hashtag [#Mirenababy] with every belly pic and ultrasound pic she posted. She was concerned, however, she would end up losing the baby. But her little guy had his own plan. A week before Dexter Benjamin Manuel Tyler arrived and so did the IUD. Many news outlets have reported the baby was born holding the IUD, but Lucy says it was probably one of the nurses or his father’s idea to have him pose with it. After all, he was born despite it. This is not the first time, the Mirena IUD has been in the spotlight for the wrong reasons. In 2014, lawsuits were filed in Canada and the U.S. against Bayer alleging that women weren’t properly warned about rare but potentially serious risks associated with the intrauterine device. In 2013, it was reported to Health Canada that Mirena IUDs were responsible for 52 uterine perforations. Some women also revealed the device migrated to other parts of their bodies after insertion.